That some cricket boards at least have begun to grasp the importance of the Internet in the world of publicity and public relations. I must first congratulate the Cricket Australia. Not only have matches been screened ('streamed' is I believe the word) on the 'Net in high quality but with a couple of commentators who have played the sport and are thus fully qualified to comment on it. Their web site (although not always easy to navigate) has carried live scores for many matches and articles appear at frequent intervals. Plaudits here must also go to the West Indies who have dipped their toes in the water and allowed us back in the UK to watch England take them on. While the video stuttered from time to time including a strange time warp of which Dr Who might have been proud, it is a start and few other Boards have been that adventurous. Perhaps I should quote an example of what can be achieved. The WBBL seems, judging by the results, to be an example of how it should be done. Now I know whatever strategy you take is a leap in the dark, and also that sports' authorities are at the mercy of others, but the WBBL has shown what TV coverage can do. Hats off then to the Australian TV channel that took up the challenge and found that viewing figures exceeded not just the lowest numbers they might have feared, but possibly their wildest expectations. WBBL_02 kicks off shortly (as I'm typing this well before Christmas), and all the signs are positive. They have had one major advantage over England's attempt to start another tournament, and that is, quite simply, that it is based on an existing fan base. Is that an odd thing to say about a new tournament? Not really as the Australian States and the teams already playing for those areas, were already in existence. How much easier and more natural to follow a team that bears the name of your State, even if you've never followed women's cricket before, than one named after a town or more general area. There, I think, successful as it was, the KSL missed a trick. But more of the KSL later. ...and Natalie Sciver showing she can hit the ball as hard as anyone in the game. I have to say I felt a little sorry for the visitors being on the wrong end of a team in such fine form, but they did not help their cause with poor fielding and the bowlers not quickly learning from their mistakes. 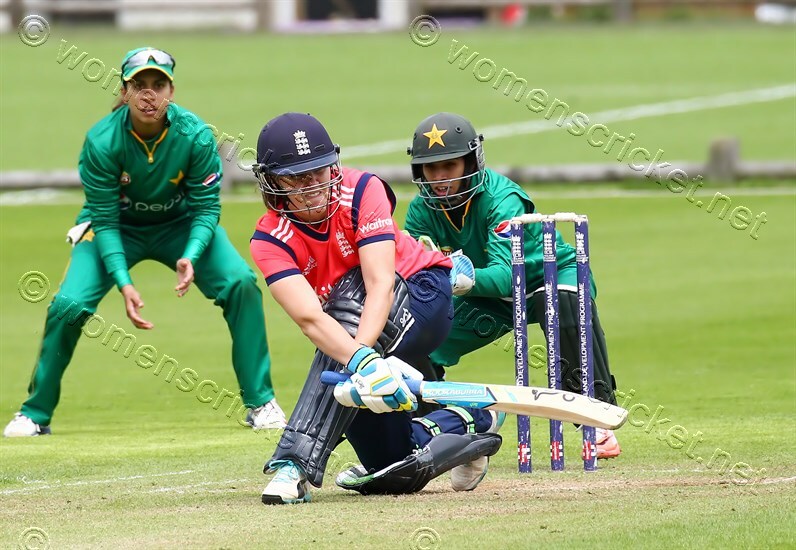 Bismah Maroof does, however, deserve a special mention for her batting, especially a stubborn 61. 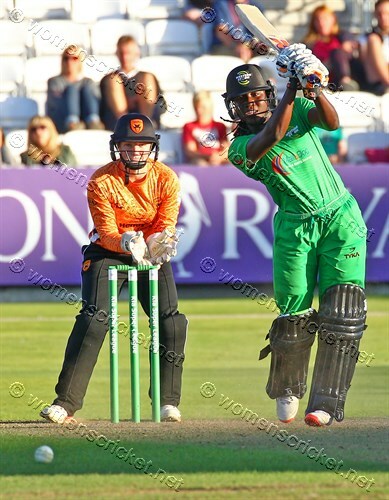 The KSL (or Kia Super League) held its maiden season. I don't think Kia can complain about the result. Some fine cricket was played, and any notes following are skewed by the games I watch and my absence from those I didn't! If there was a player of the Tournament it had again to be a batsman. Her innings at Bristol aided at the finish by fine support from Sophie Luff, must be my T20 innings of the summer. The situation demanded fast but calculated scoring and Taylor worked it to a fine art. Nat Sciver came close in several games but Taylor just pips it for me. Her 289 runs, 57 clear of the second placed Heather Knight tops the table by a respectable margin. With sometimes only 5 matches to work with and some players having the advantage of 7 it's hard to make much of some of the stats but, taking players who played at least 5 it's interesting that Paige Scholfield of Loughborough (and Sussex!) tops the 'strike rate' list at 145 around 7 runs ahead of Loughborough team mate Thea Brookes with Nat Sciver on their heels at third. It's encouraging that players currently not at international level seem to know what T20 is all about - getting on with it. Danni Wyatt's 120* from 130 balls, the highest individual innings in the County Championship in 2016 by any player, was not made in the easiest of conditions. Not only was the bounce at Hove unpredictable at times, but she had to see off one of the finest quick bowling performances of the summer as Nat Sciver, bowling down the hill, was close to unplayable. How Nat closed out the day without a wicket is a mystery to me. It was one of those situations, not uncommon in this sport, where, if you were there to watch, the scorecard seems to lie. While only 28 from Paige Scholfield, 19 from Hannah Phelps and 17 from Chiara Green provided some extra runs, others with single figures gritted their teeth, held back the onslaught and allowed Danni to win the day. Those present had a treat in both flair and determination by players on both sides. In a low scoring county season, Evelyn Jones of Staffs made the only other century (110 off 107) in Division One, the Surrey bowlers again being the unlucky recipients of someone in touch. So 2016 comes to an end and 2017 beckons. A world cup is in prospect although how many matches fans will be able to watch is still something of a closely guarded secret, and the Kia Super League T20 will follow that with the KSL 50-over abandoned for 2017 (and maybe for good?). The season kicks off with the County Championship matches the fixtures for which are already on this site, although venues are thin on the ground at the moment. If anyone has information not included so far then I'd be VERY grateful. This amount of typing is a little unusual for me - I prefer where I can to let the pictures do the talking. I hope you'll join me on a boundary somewhere in 2017!